On Tuesday night, I went into a flurry of rearranging the living and dining rooms. I mostly blame it on watching copious amounts of HGTV, which I usually have on in the background while I'm working (that or Food Network), but I have to lay some blame on my constant change of mind. Something I like one week oftentimes becomes a "What was I thinking?" moment the next month. While switching out the buffet in our entryway with the one in the dining room, I uncovered my stack of Better Homes & Gardens issues from the '60s. I had been wondering where they'd gone, and I guess I shoved them under the buffet in a speed cleaning session. 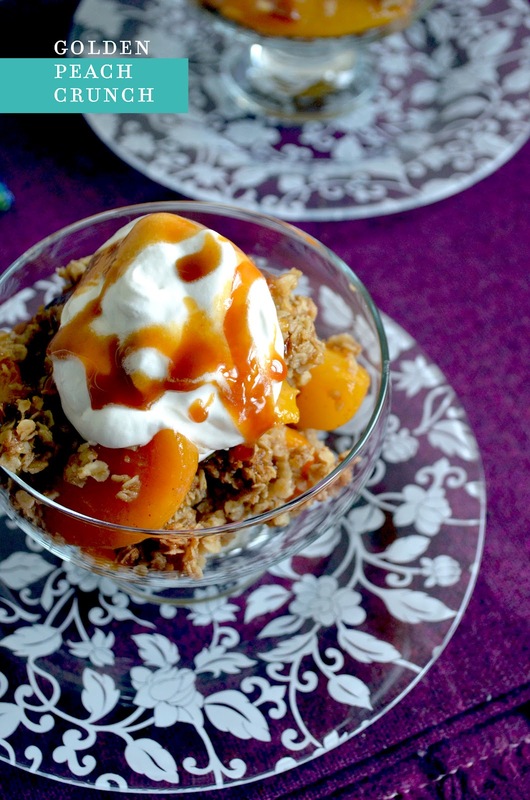 Yesterday I had some free time to sit down with the March issues from 1963, 1964 and 1967, and came across a dessert I knew we had to try that night: Golden Peach Crunch. It couldn't be more simple to put together, and the flavors were so refreshing! Sliced peaches mixed with cinnamon and nutmeg, then topped with a mixture of quick oats, brown sugar, butter and salt. Throw it in the oven, and 30 minutes later you're in piping hot, fruit-filled heaven. 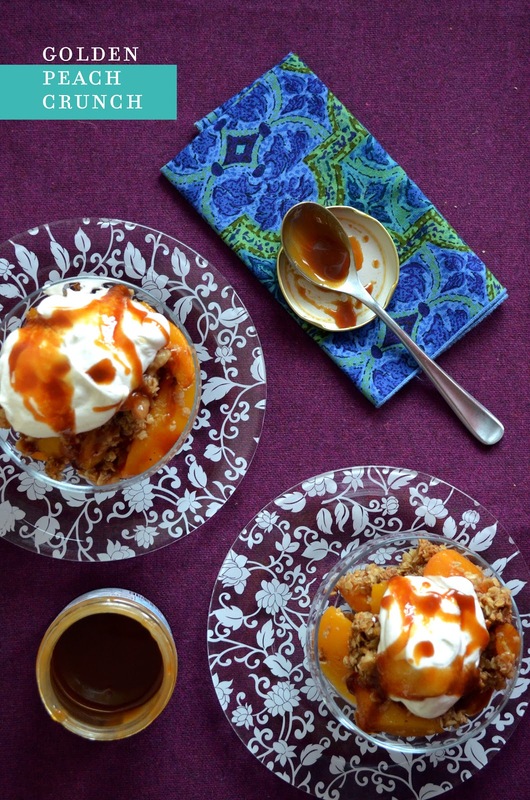 I, of course, made one little tweak, which was the addition of some fleur de sel caramel on top of the whipped cream. It's my latest food product obsession, and it offset the sweetness of this dish so nicely! I highly recommend you give it a try (you can find it at Trader Joe's). Now I'm off to pack for my trip to Omaha this weekend, visiting my brother and sis-in-law. Last time I was there, I was up to my ears in snow, but the weather looks much milder this time around. The rentals and I might be stopping at some antique malls along the way, so you can bet I'll have some vintage goodies to share with you on Monday! Have a great weekend! Drain peach slices thoroughly; mix with cornstarch, cinnamon, nutmeg and lemon juice; turn into 8-inch baking dish. Combine oats, butter, sugar and salt; mix until crumbly. Sprinkle over peaches. Bake in 375-degree oven about 30 minutes. Serve hot with plain or whipped cream.